﻿JustRenos ﻿is a social enterprise birthed out of JustWork Economic Initiative - a non-profit organization that fosters dignified, gainful work opportunities through the development of holistic approaches to social transformation. Since its inception in 2008 in response to the local demand for timber-based landscaping and property maintenance projects, JustRenos has worked diligently to create a painting and renovations company that offers professional services with added value at competitive rates. JustRenos is run by qualified professionals who lead and manage each project. Among our many JustRenos team members (20 and counting), here are ﻿some ﻿of the key players in our group. What we aim for - JustReno﻿s aspires to become a place of holistic transformation for the well-being of all parties involved: our ﻿cu﻿stomers﻿, our workers, and the community as a whole. ﻿Who ﻿we are - Just as places need renovation and transformation, so do people. 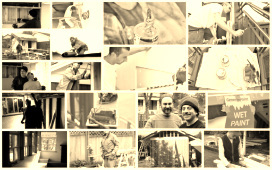 Inspired by our social mandate, JustRenos is dedicated to ﻿restoring ﻿places and transforming people. We are compelled to add value to our stakeholders by means of bringing material, personal, social, and ecological renewal. What we value - people, places, an﻿﻿d relationships - we are convinced that all good work flows from that. We believe that dignifying workplaces motivate our team members to give their best in the service of our customers, our city, and our world.